The U.S. economy stalled in the first three months of 2014, but don't panic yet as it's probably just the winter weather effect. Gross domestic product, the broadest measure of economic activity, grew at a 0.1% annual pace in the first quarter, the U.S. Bureau of Economic Analysis reported Wednesday. That's brutally slow, even by sluggish post-recession standards. 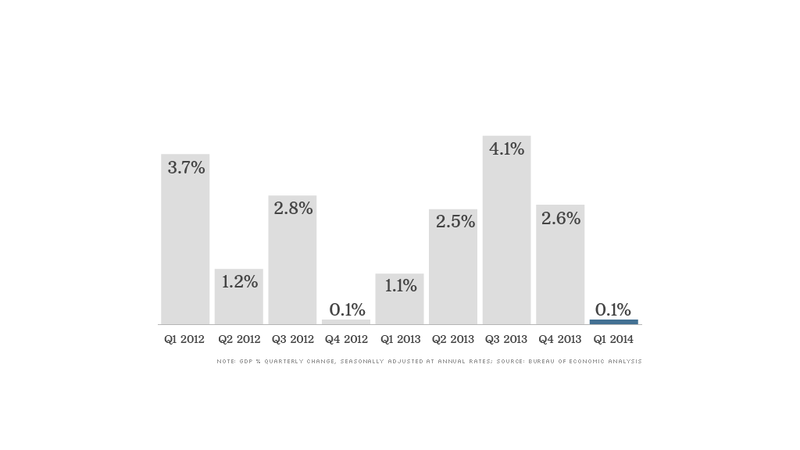 Since the Great Recession ended in June 2009, the economy has been growing at a rate of about 2% to 3% per year. Economists think the slowdown is merely a temporary phenomenon due to harsh winter weather. If that theory holds true, the economy should bounce back in the spring. "Take this report with a grain of salt," said Brett Ryan, U.S. economist for Deutsche Bank. "It's certainly not a good report, but there's plenty of evidence of a weather impact." Slumps in exports, housing and business investment, especially on equipment, were the main drivers behind the weak performance. All those things can be slowed by snow, hail and other winter storms as shipments are delayed or construction is put on hold. In contrast, people are still buying things. Consumer spending continues to be a bright spot, growing at a 3% annual pace. Consumers shelled out more money on health care, in particular. The Bureau of Economic Analysis noted that the health care increase was driven primarily by the implementation of the Affordable Care Act. Consumers also spent more on utilities probably because of the cold temperatures, but they cut back on clothing, household furnishings and eating out at restaurants. Today's GDP figures are based on incomplete data, and will be revised at least three times in the next few months. Looking ahead, this week brings the first glimpse at how the economy fared in April, and the numbers should finally be clear of weather-related distortions. A separate report released Wednesday showed the private sector added 220,000 jobs this month, according to payroll processor ADP (ADP). That's the strongest job growth since November. The government's official jobs report, due out on Friday, is also expected to show hiring at its highest since November. Economists surveyed by CNNMoney predict the U.S. economy added 205,000 jobs in April. They also expect the official unemployment rate to fall to 6.6%, down a notch from 6.7% in March. In the meantime, the Federal Reserve is widely expected to remain in "wait-and-see" mode, in the hopes of getting a clearer picture of U.S. economic strength. So far this year, Federal Reserve Chair Janet Yellen has blamed much of the weak economic data on the weather. The central bank's top officials met this week and will release their latest statement on the economy this afternoon. Aside from a minor reduction in bond purchases, economists aren't expecting any major announcements. The Fed has been buying bonds to stimulate the U.S. economy on and off since 2008, but the central bank is now gradually bringing that program to an end. The wind-down process is known as "tapering," and the latest round is expected to reduce bond purchases to around $45 billion a month.